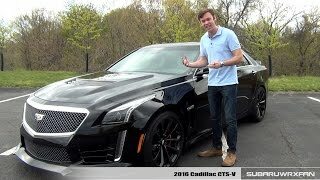 After its debut in 2004 Cadillac CTS-V made remarkable improvements in its technology and here for the year 2016, Cadillac is all set to with its new release Cadillac CTS-V 2016. With its V-8 engine and massive horsepower adored with features company aims to compete with the BMW M4 and Mercedes E63 AMG. Let us have a closer sneak to know if the model is truly worth the competition or not. The interior of Cadillac CTS-V 2016 gets glorifying with the luxurious looks it carries keeping that massive power beneath its hood. Things to grab your attention in the interior are the use of soft touch materials over steering wheel and decorative stitching around the cabin. Following knocks your eyelids the 12.3 inch instrument cluster carrying V-series graphics and a full-color head up display as a carry forward from standard versions. The same queue gets enlarged with the Boss surround sound audio system and wireless inductive phone charging. Previously seen Siri Eyes free and OnStar 4G LTE connectivity with built-in Wi-Fi hotspot, comes with performance data recorder to add to ease. The fully luxurious, spacious and future features loaded interior of Cadillac CTS-V 2016 welcome its buyers in three color combinations of Light Platinum, saffron and jet black with the essence of Jet Black being mutual in all. The exterior of Cadillac CTS-V 2016 apart from its headlamps gets a revision in each of its traits. The revised works are done keeping in mind the add-ons to be inculcated in the performance and bringing the CTS-V 2016 an aggressive appearance. Beginning with the front fascia of Cadillac CTS-V 2016, an all new mesh pattern has been noticed in the narrower grille. Carrying the same honeycomb mesh the air dam below gets a larger look making the arena catchier and aggressive. Apron of Cadillac CTS-V portrays a carbon-fiber splitter, giving the knock of reduced weight technology adopted to make the Cadillac CTS-V 2016. 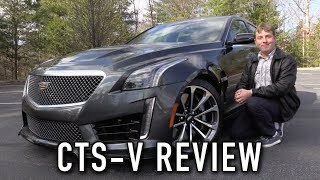 Talking about the rear fascia of Cadillac CTS-V 2016 trunk-lid spoiler and bumper makes the model distinct while a plain apron gets replaced by round quad pipes carrying looks of a diffuser like piece. A performance specification of Cadillac CTS-V 2016 is that one segment where it truly left behind BMW M5 and Mercedes member on paper. 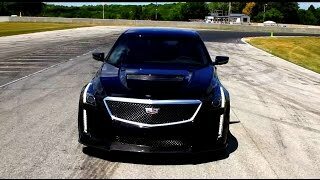 Powered by a 6.2 liter V8 engine the Cadillac CTS-V 2016 produces 640 HP of power and 854 nm torque. 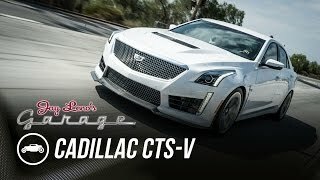 The calculations are high above the model CTS-V 2016 replaced. Pairing to Eight speed automatic transmission the Cadillac CTS-V 2016 top-speed touched the mark of 200 mph while the 0-60 mph sprint sits at 3.7 seconds. However this is just one point where the member of Mercedes takes a lap ahead by completing the sprint in 3.5 seconds.